Everyone is familiar with the distinctive black and white sea mammals known as "killer whales." These beautiful creatures are also commonly known as Orca whales, and they are currently considered a threatened wildlife species. 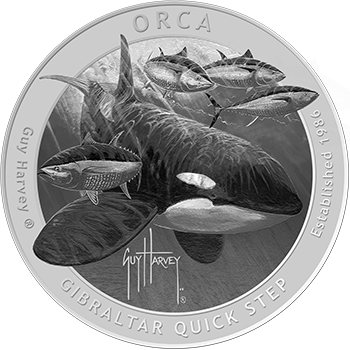 Magnificently represented in the artwork of Guy Harvey, the Orca now makes its debut on silver bullion with the officially licensed Guy Harvey Series 3 Orca Silver Round! In addition to being struck from .999 fine silver, these rounds feature a gorgeous proof-like finish. Guy Harvey’s 2004 painting “Gibraltar Quick Step” captures a captivating scene of four Atlantic bluefin tuna running ahead of a huge orca (killer whale.) While it may seem that they are just having fun blasting along just under the water’s surface, it is a life or death situation for the tuna. Two of the tuna have just re-entered the water after leaping into the air to avoid the orca’s attack. Everyone in the painting is moving at high speed, moving at the “quick step.” Orca have been seen in the Straits of Gibraltar for over 2,000 years. One of their favorite meals in the Atlantic bluefin tuna, named “King of the Fish” by Ernest Hemingway. The Atlantic bluefin tuna, which can grow to 450kg (90lb), use the Mediterranean as their western spawning ground. This gives the orca a twice-a-year opportunity to attack them in the choke point of the Straits. Bluefin tuna are faster than orca, but orca have more stamina. They will chase the tuna at top speed for 30 minutes or more, until the fish are exhausted. Beware the "killer whale"! Officially known as an Orca whale, these distinctive marine mammals are the star attraction of the Guy Harvey Collection Series 3. 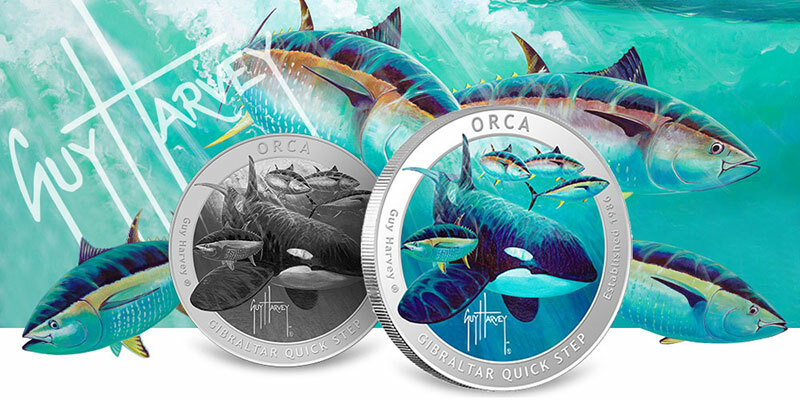 The unmistakable Orca appears on Brilliant Uncirculated silver and colorized silver for a wide array of collecting options. The Orca Silver Round from Series 3 of the Guy Harvey Collection comes in an eye-appealing proof-like variety. With its proof-like finish, the round features selected frosting as well as reflective surfaces around the outer rim. The original Guy Harvey design of an Orca whale swimming with amberjack fish shows both the intimidating character of the "killer whale" as well as its lovable appearance. The incredible realism of the artist's work comes through in the fine detail of the design translated onto the surface of these 1-ounce silver rounds. 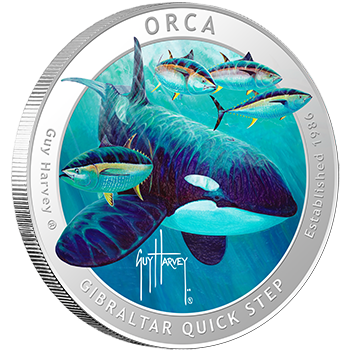 The original "Gibraltar Quick Step" design used for the Guy Harvey Series 3 Orca 1 oz Silver Round comes to life in this fully colorized version. The distinctive black and white coloration of the Orca stands out against the vibrant blue and green colors of the surrounding ocean water and accompanying sea life. 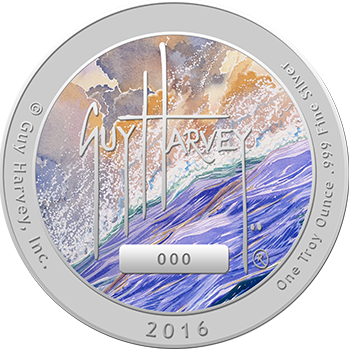 In addition to its captivating beauty, the Guy Harvey Orca 1 oz Colorized Silver Round is struck from .999 fine silver for a total of 1 troy ounce of pure silver.